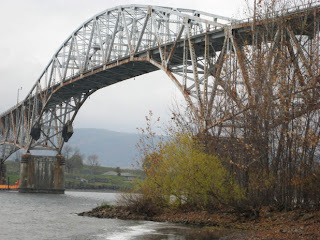 On Sunday, September 30, 2012, state historic site managers Thomas Hughes at Crown Point, New York, and Elsa Gilbertson at Chimney Point, Vermont, will lead a guided round-trip walk across the new Lake Champlain Bridge connecting New York and Vermont. For centuries, this crossing has been used by Woodlands Indians, the French, the British, and Americans. The narrow channel passage for water vessels and the peninsulas, or points, on either side made this one of the most strategic military locations along Lake Champlain, especially during the 1700s. Foliage will be at near peak this weekend, and this tour is an official National Public Lands Day (www.publiclandsday.org) activity, while for Chimney Point, this tour is the final public activity of Vermont Archeology Month (www.vtarchaeology.org). This tour (also the last of the season) starts at 1 pm at the museum entrance at Crown Point State Historic Site. The fee is $5 for adults, free for children under 15. Crown Point State Historic Site enjoys breath-taking views of the Lake Champlain Bridge and is located at 21 Grandview Drive on the Crown Point peninsula. The public may phone 518-597-3666 for the site’s museum. Chimney Point State Historic Site is located at 8149 VT Route 17, at the Vermont foot of the Lake Champlain Bridge. The public may phone the site office at 802-759-2412 for information. Both sites are open and staffed into October on site-specific weekdays plus Saturdays and Sundays from 9:30 a.m. until 5:00 p.m. Photos: Above, the new Crown Point Bridge from the Crown Point side- Below, the Crown Point Bridge from Chimney Point, which opened in 1929 and was torn down in 2011. People from all over the northeast begin gathering today at the Chimney Point State Historic Site on Lake Champlain in Addison, Vermont, for this weekend’s annual Open Atlatl Championship. The event is back at Chimney Point after two years at Mount Independence, due to the site’s closure during the Lake Champlain Bridge construction project. The atlatl is the ancient tool used the world over before the bow and arrow to effectively project darts and spears for hunting. During the bridge project archeology work, a number of projectile points were found here, indicating the atlatl was used historically on the very location of this championship, now in its 17th year. The event is a highlight of September’s Vermont Archaeology Month and is part of the Festival of Nations with the Crown Point, New York, State Historic Site. Come watch or participate in this unusual and interesting event. Competitors range from enthusiasts interested in trying their hand to some of the best in the country. Admission includes the museum with the 2012 exhibit on bridge archeological findings, new exhibits on the 1929 bridge, and shop with books and other items on the area’s Native American, French, and early American history. $3.00 for adults, free for children under 15. Friday, September 21: atlatl workshop with Robert Berg of Thunderbird Atlatl, $65 fee includes materials and instruction, pre-registration required, noon to 5 pm. Berg teaches all over the United States and Europe. Call 802-759-2412 to pre-register. Saturday, September 22: atlatl competition, from 10:30 until contestants have finished. $5.00 fee for competitors. Girls, boys, women, and men’s categories. All skills and abilities welcome. International Standards Accuracy Competition first, then shooting at painted animal targets to test accuracy, and lastly distance. Demonstrations of Woodland pottery making with Charlie Paquin and atlatl, flintknapping, cordage making and more with Thunderbird atlatl. Sunday, September 23: small International Standards Accuracy Competition at 10:00, followed by master coaching (approx. 11:00 am). Flintknapping workshop with Charlie Paquin from 10:00 to 3:00—limited slots to participate, pre-registration required, observers welcome. 1:30 &#8211 2:30: Va-et-Vient live acoustic concert with Vermont musicians Carol Reed, Suzanne Germain, and George Dunne. 2:30: Clinton Community College Professor David Graham speaks on the French heritage of the United States, particularly New York. Graham was project manager for the second edition of the 2012 book J’aime New York. Book signing follows talk. The Chimney Point State Historic Site presents the history of the region’s three earliest cultures—Native American, French Colonial, and early American. The site was used by Native Americans for thousands of years, was the location of the 1731 French fort, and the museum is in the c.1785 tavern building. It is located at 8149 VT Route 17W in Addison at the foot of the new Lake Champlain Bridge. The site is open 9:30 to 5:00, Wednesdays through Sundays, with the last day of the season being Columbus Day, October 8. Call 802-759-2412 for information. For more information about the Vermont State-Owned Historic Sites visit www.historicsites.vermont.gov. Join the Vermont State Historic Sites conversation on Facebook. What follows is a guest essay by Thomas Hughes, Director of the Crown Point State Historic Site on Lake Champlain in Essex County, NY. The site includes two National Historic Landmarks: the ruins of French-built Fort St. Frederic (1734-59) and the ruins of Crown Point’s British fort (1759-73). 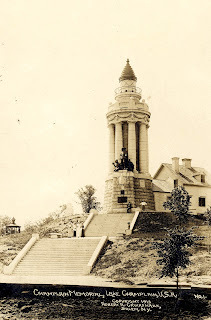 Dedicated 100 years ago this month on July 5, 1912, and located at a prominent site that is steeped in history, the Champlain Memorial Lighthouse serves as a monument to the 1609 voyage on Lake Champlain by French explorer Samuel Champlain. This Champlain Memorial rises from a small point of land just southeast of the Lake Champlain Bridge. In July 1609, Samuel Champlain was the first European to record seeing this majestic lake which he named for himself. Late that month, Algonquin, Huron, and Montagnais Indians in canoes guided Champlain and two fellow Frenchmen southward from the St. Lawrence River region onto Lake Champlain, so that the three Europeans might join the Algonquins in a military engagement against the Algonquin’s Iroquois enemies. A battle took place (perhaps near the present-day site of the lighthouse), the arquebus firearms used by the three Frenchmen proved decisive, and the Algonquins and French returned northward. Over 100 years later, the French built a fortified windmill here (circa 1737), as part of their Fort St. Frederic military and civilian complex. The windmill ground grain for the fort garrison and for the nearby French civilian population but also served as an outer military defensive structure in that the windmill was fortified with cannons. The French blew up their windmill in late-July 1759, as the French military abandoned Fort St. Frederic to the advancing British army. In August 1759, when the British began to build a vast Crown Point fort, to be their primary fortification on Lake Champlain, the lighthouse site was chosen for one of their outer forts, the Grenadier Redoubt. Remains of part of the Grenadier Redoubt can still be seen today, immediately south of the lighthouse. 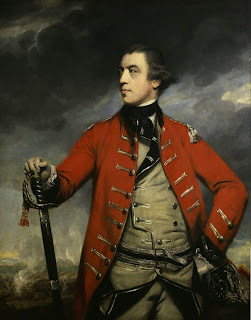 On May 12, 1775, during the outbreak of the War for Independence, a few British soldiers at Crown Point were captured by 100 “Green Mountain Boys” (from the Hampshire Grants) under the command of Seth Warner. In addition to taking the strategic location from the British, the rebels liberated a great prize: 111 British cannon. In peacetime, commerce grew on Lake Champlain, as did the need for a lighthouse at the narrows at the point of the Crown Point peninsula. The Crown Point Lighthouse was built in 1858 as a 55-foot octagonal limestone tower. Trapezoidal windowpanes encased the lantern room, from where a fifth-order Fresnel lens beamed a fixed white light at a focal plane of eighty-three feet. The Crown Point Lighthouse faithfully served for over 70 years. In time for the 300th anniversaries in 1909, the States of New York and Vermont each established tercentennial commissions to organize events to celebrate Champlain’s lake voyage. 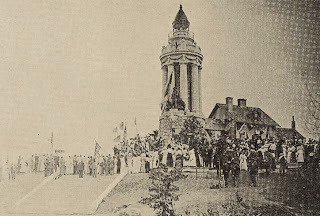 The festivities that the commissions organized commenced at Crown Point on Monday, July 5, 1909 with an address by New York State Governor (Glens Falls native and future U.S. Supreme Court Chief Justice) Charles Evans Hughes, Indian pageants, and fireworks. Besides planning the week-long celebration, the commissions from New York and Vermont also desired to erect a suitable and permanent memorial to Champlain. One suggestion that appeared in a local newspaper as a Letter to the Editor was to convert an existing lighthouse into a memorial. Incorporating the memorial with a lighthouse seemed a fitting way to commemorate an explorer and navigator of Champlain’s stature. Various sites on Lake Champlain (including Cumberland Head, Plattsburgh, Isle La Motte, Bluff Point, Split Rock, Rock Dunder, Ticonderoga, Mount Defiance, and Juniper Island) were considered for the memorial before the two commissions, with the blessing of the U.S. Lighthouse Service, agreed in 1910 on Crown Point. With $50,000 in funds set aside from the Tercentennial Commissions, work began on the memorial to Champlain and his exploration of the lake. The memorial was designed by Dillon, McClellan, and Beadel. The Champlain Memorial is classical and French Renaissance in style, with heavy stone columns, entablature, ornamental frieze and setbacks. The limestone exterior of the lighthouse was replaced with eight Roman Doric columns resting upon a conical base made of Fox Island granite from Maine. An ornate cornice, parapet, and lantern room were also added to complete the memorial. Parts of the foundation, the interior brick, and the cylindrical shaft holding the spiral stone staircase remain from the 1858 lighthouse. On the side of the memorial that faces Vermont, are bronze sculptures, the largest of which was crafted by German-American Carl A. Heber (1875-1956). It depicts, above the prow of a canoe which appears to be filled with furs, Champlain standing in the center, flanked by a crouching Huron guide and a French Voyageur. These larger-than-life-size figures were cast at the Roman Bronze Works in Brooklyn. Two months before the July 1912 dedication, France had donated a bronze profile bust (for which sculptress Camille Claudel had been the model), sculpted by the great French artist Auguste Rodin, to be incorporated into the monument. At the dedication of the memorial, the leader of the visiting French delegation remarked “The United States is raising a monument to a Frenchman, and France sends you, through us, her tribute of gratitude.” The Rodin “La France” sculpture remains visible, as located on the memorial exterior, below the larger-than-life sculpture of Champlain. of the 1909-1912 observance of Champlain’s voyage on the lake. On each side of the monument are coats of arms: New France (French North America, 1609-1763), the State of Vermont, France (at the time of Louis XIII), the United States of America, the State of New York, and Brouage (Champlain’s birthplace in France). With the opening of the nearby Lake Champlain Bridge on August 26, 1929, the usefulness of the light as a navigational aid was short-lived. The lighthouse was taken out of active service circa 1930 and deeded to the State of New York. The light keeper’s wooden Cape Cod-style cottage, attached to the memorial lighthouse, was eventually removed. Today the Champlain Memorial lighthouse is part of the Crown Point Reservation Campground and is open to the public. The lighthouse is under the stewardship of the New York State Department of Environmental Conservation. A few years ago, government funds were used to repair the covered steamboat pier that was added during the 1930s and to restore the historic lighthouse, a symbol of Crown Point’s history. The restoration of the lighthouse exterior was completed in time for the 2009 quadricentennial celebration of Champlain’s historic voyage and the “La France” sculpture by Rodin was cleaned. On September 19, 2009, this Champlain Memorial was publicly re-dedicated by the states of Vermont and New York. Four weeks later, the Lake Champlain Bridge closed and during 2010 and 2011, a replacement bridge was constructed beside the lighthouse. The Champlain Memorial is visible from a sidewalk on the popular new bridge. When I set out to write From Forest to Fields: A History of Agriculture in New York’s Champlain Valley, I became discouraged by the mixed information coming from various authors. While there is archeological evidence of Native settlements in Plattsburgh at Cumberland Bay, across Lake Champlain in Vermont and along the Hudson River and its tributaries, little information exists for the rest of the Adirondack Coast. In the following, I will present the information from resource materials so that readers may better understand the conclusions presented in our short history. Therefore, we can determine the Champlain did in fact see native agricultural development in New York’s Champlain Valley. 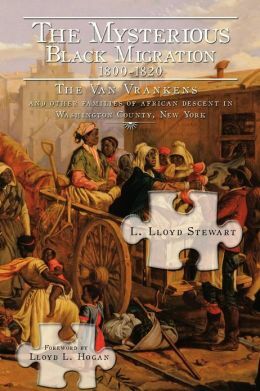 However, if we move forward to 1858, Flavius J. Cook, author of Home Sketches of Essex County, has a very different perspective. Cook concludes that prior to the European exploration, that the area between Horicon and Lake Champlain was an uninhabited no-man’s land between warring tribes, despite Champlain’s contrary observations. This conclusion was even shared in the 20th century in the Ticonderoga Historical Society’s Patches and Patterns from Its Past (1969). The Iroquois were powerful, plitic, warlike and courageous … They lived in villages, around which they had extensive cultivated fields … The Algonquians were a warlike nation and a migratory people, disdaining the cultivation of the soil and depending altogether on the produce of the chase. The Hurons had some slight knowledge of husbandry, but were more effeminate and luxurious than the other tribes, and inferior in savage virtue and independence. They lived in villages, of which the nation possessed twenty, but were inferior in construction and strength to those of the Iroquois. The conclusion that we draw in From Forest to Fields is that it would be shortsighted to overlook Champlain’s observation of corn and meal grown at Ticonderoga, particularly with the knowledge we have of the Algonquin, Iroquois and Huron tribes living in the surrounding areas. It is much more likely that migratory tribes lived in this area, depending primarily on cultivated wild foods, fish and game. To a much lesser extent, they would grow corn, beans and squash (the Three Sisters) as part of a companion planting system that left them free to pursue their seasonal migration from winter villages to summer camps near the Lake. Since this is a more “mobile” culture, it would be easy for a tribe to retreat into the forest in instances of impending danger, and for observers to conclude that no Native settlements existed in this area. Archaeological work confirmed that the site has had a history of human habitation for 9,000 years, since the glacial waters receded, and that this was one of the most strategic spots on Lake Champlain for the Native Americans, French, British, and early Americans. What evidence did all these people leave behind? The doors open to the public at 6:30 p.m. Come early, bring a picnic, go for a walk across the new bridge, and take a quick look at this year’s exhibit, “What Lies Beneath: 9,000 Years of History at Chimney Point,” before the talk at 7:00 p.m. The public is welcome. Free, donations appreciated. The Chimney Point State Historic Site is located at 8149 VT Route 17, at the foot of the new Lake Champlain Bridge. Call 802-759-2412 for information. The site is open Wednesdays through Sundays and Monday holidays through Columbus Day, 9:30 a.m. to 5:00 p.m.
For information about Vermont’s State-Owned Historic Sites, visit: http://historicsites.vermont.gov Join the Vermont State Historic Sites conversation on Facebook. The Chimney Point, Mount Independence, and Hubbardton Battlefield State Historic Sites have opened for the 2012 season. The Chimney Point State Historic Site on Lake Champlain in Addison has reopened to the public after two years of closure due to the Lake Champlain Bridge construction project. This location is one of the most strategic on the Lake, important to Native Americans, the early French, and early American settlement. In the historic tavern’s “ballroom” is a new exhibit, What Lies Beneath: 9,000 Years of History at Chimney Point, highlighting the archaeological findings from the 2009-2011 bridge and temporary ferry project. See evidence of earliest Native American habitation, the 1731 French fort, Moses Bradley’s 1790s redware pottery, and more. The exhibit was prepared by the University of Vermont Consulting Archeology Program and guest curator Kate Kenney, Vermont bridge project archaeological monitor. Also new are several exhibit panels and media player exploring the history of the 1929 Lake Champlain Bridge. Bring a picnic and take a walk over the new bridge. The site is open Wednesdays through Sundays and Monday holidays, through October 8, 9:30-5:30. Admission is $3.00 for adults and free for children under 15. Orwell’s Mount Independence, a National Historic Landmark named after the Declaration of Independence, was built on Lake Champlain in 1776-77 to protect the American colonies against British invasion from the north. This year is the 235th anniversary of the American retreat from the Mount. The museum has state of the art exhibits and Revolutionary War artifacts, including two huge logs from the Great Bridge and a cannon recovered from Lake Champlain. Six miles of scenic walking and hiking trails wind past archaeological sites. The nationally award winning Baldwin Trail with acclaimed interpretive signage, is suitable for outdoor wheelchairs and strollers. The annual Soldiers Atop the Mount encampment is moving this year to September 8 and 9 to commemorate the September 1777 American attempt to retake the Mount from the British. The site is open daily, 9:30 to 5:00, through October 8. Admission is $5.00 for adults and free for children under 15. The Hubbardton Battlefield State Historic Site is the location of Vermont’s only Revolutionary War battle. It is considered one of the best preserved battlefields in America, retaining most of its original setting. The 235th anniversary of the July 7, 1777, battle will be honored with the annual living history weekend on July 7 and 8. Enjoy other history and astronomy programs throughout the season. The site is open Thursdays through Sundays and Monday holidays, from 9:30 to 5:00. Admission is $2.00 for adults and free for children under 15. These sites have scenic grounds for walking and picnics, and specialty museum shops with many books and other items. For more information about events visit: http://historicsites.vermont.gov/events/ Join the Vermont State Historic Sites on Facebook. 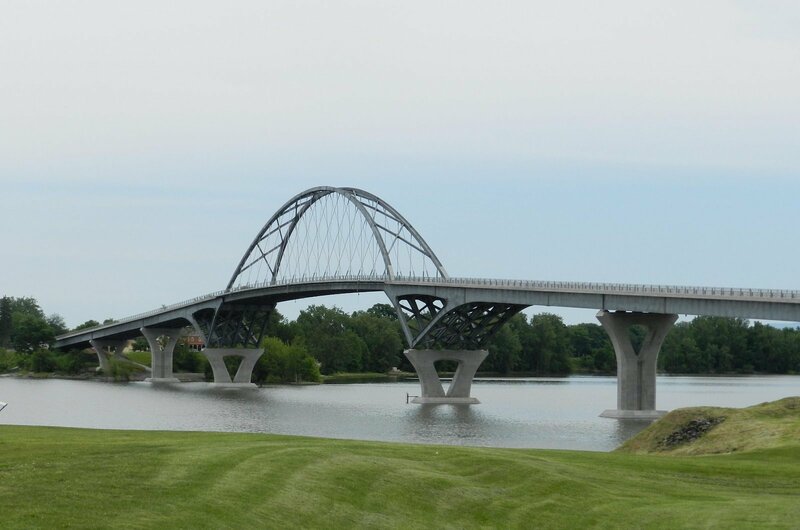 After many months of planning the Lake Champlain Bridge Community (LCBC) will host its two-day Grand Celebration which celebrates the re-opening of the Lake Champlain Bridge and the re-connected New York and Vermont communities that surround it. The bridge re-opened to traffic on November 7, 2011, but the celebration was postponed until now. The Grand Celebration will take place on Saturday and Sunday, May 19 and 20. Saturday’s events begin at 9 a.m. with an opening ceremony and end at approximately 10 p.m. after a street dance. Sunday’s events begin at 6 a.m. with a sunrise ecumenical service and close with a fireworks show at dusk. All events will take place at or near the Chimney Point State Historic Site, Addison, Vermont and the Crown Point State Historic Site, Crown Point, New York. All of the weekend’s events are free and will take place rain or shine. A schedule of events is available at LCBC’s website. A more detailed schedule, including times of musical and entertainment performances, will be available in the official event program. The program, published by The Addison Independent, will be for sale in advance and during the celebration weekend at a cost of $3/each. Proceeds from program sales will help defray the cost of the event. The weekend kicks off with an opening ceremony at 9 a.m. at Crown Point State Historic Site (NY). Theodore (Ted) Zoli, PE, National Director of Long-Span Bridges for HNTB Corporation is the bridge’s designer and will be the keynote speaker. Several other dignitaries and representatives from federal, state and local governments and agencies will be in attendance and available for a meet & greet with the public immediately after the ceremony. Two of the weekend’s highlights are parades—one across the Lake Champlain Bridge and one underneath it on the water. The Old Time Hometown Grand Parade (pedestrians and autos) will begin at 11 a.m. on Saturday and move from Vermont to New York. The bridge will be closed to traffic during this time—approximately 60 to 90 minutes. There are currently more than 120 parade participants and some examples of the types of floats attendees will see include the original float that was in the parade that celebrated the 1929 opening as well as floats provided by the Vermont Historic Sites consisting of Chimney Point, Mount Independence w/ Fife & Drum Corp, Hubbardton Battlefield, Old Constitution House, Bennington Battle Monument and the Vermont State House. Total entrants into the parade are approximately 120 floats and vehicles. Attendees will see many vintage vehicles in the parade—some dating from 1929 when the first Lake Champlain Bridge was opened and dedicated. Riding in the cars will be several guests who were present at the 1929 opening. These people have been dubbed “the 29ers”, and organizers expect more than 25 of them will participate in the 2012 celebration. A private reception for the 29ers is planned during the weekend to honor their attendance at both events. Featuring many types of vessels, and led by the Lake Champlain Maritime Museum’s schooner Lois McClure, there will be a boat flotilla that travels underneath the bridge. Formation will start at 12:30 p.m. and the flotilla will begin under the bridge at 1 p.m. on Saturday. The direction of boat traffic (north to south/south to north) will depend on prevailing winds. There is detailed information on joining the flotilla on LCBC’s website under the Celebration Events section. Saturday’s activities will close with a street dance featuring Rick and the Ramblers. The dance will begin at 7 p.m. at the Crown Point State Historic Site (NY) and will be preceded by a dance across the bridge starting from Vermont’s Chimney Point State Historic Site at 6:30 p.m.
Sunday’s activities begin with a sunrise ecumenical service, beginning at 6 a.m. Services are on either side of the Lake Champlain Bridge and all will join at the center of the after the ceremony in a symbol of reunification. 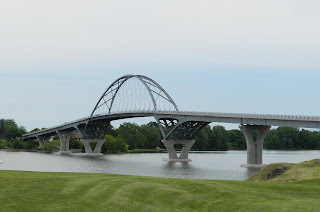 At 3 p.m. on Sunday there will be a 5 kilometer fun run that starts and finishes at the Crown Point State Historic Site (NY) and includes a historic run over the new bridge. More details can be found at La Chute Road Runners’ website. The weekend’s events will wrap up with a closing ceremony at the Chimney Point State Historic Site (VT) featuring Carol Reed of the French Canadian group Va et Vient and the Lake Champlain Waldorf School Dancers. At dusk (approximately 8:30 p.m.) is the grand finale—the Lights on the Lake Fireworks Spectacular. The fireworks show is provided by Alonzo Fireworks based in Albany, NY and will be simulcast by WVTK 92.1. The firework’s soundtrack is provided by UNIR1 Network. In order to hear the music soundtrack accompanying the fireworks, attendees must have FM radio reception—MP3 players, boom box, or car radio. iPhones will have a few seconds’ delay in reception. There are more than 50 crafters, food vendors, and non-profit agencies that will be exhibiting, educating and selling their products and services. Crafter and vendor booths will be set up underneath large tents on both sides of Lake Champlain. Food vendors will be located at The Bridge Restaurant on the Vermont side, and a wine tasting tent is located at Cottonwood on Lake Champlain, a Victorian house located at the foot of the bridge on the Vermont side, across the road from Chimney Point State Park. A complete list of crafters and vendors can be found on LCBC’s website, under Celebration Events, or in the official event program. Booths are open from 10 a.m. to 6 p.m. both days. Throughout the weekend there is a non-stop line up of performers, musicians and dancers. Performances will be held at both state historic sites and a detailed schedule will be available in the official event program. A vintage car show will be held both days at the Crown Point State Historic Site (NY). The show will be open 1 to 5 p.m. on Saturday and 11 a.m. to 4 p.m. on Sunday. Hosted by the Vermont Automobile Enthusiasts, there will be as many as 50 cars participating—including, but not limited to the vintage vehicles that participated in Saturday’s parade across the bridge. After a two year closure to accommodate the construction of the water ferries and bridge, the Chimney Point Historic Site (VT) re-opens the weekend of May 19-20th as well. There are many activities planned on both days to bring to life the 9,000 year history of Chimney Point and the bridge project archeological findings. Enjoy a living history encampment, from the Native Americans to the French period and the Revolution, demonstrations of early skills such as stone tool making and spinning, spinning, historic boat replicas on Saturday, and a variety of children’s activities. See the new exhibit with highlights of the archeological discoveries, from the earliest years of Native American presence to the 1731 French fort and 1790s redware pottery. The parking area will be at the Crown Point (NY) State Historic Site. There will be two shuttle buses that will run continuously during event hours from the New York parking lot, to the New York waterfront, and to the ferry landing in Vermont. Below is a list of the boat launches available during the weekend. An online auction is being held in conjunction with the event. More than 20 items have been donated by local businesses and artists. Proceeds from the auction will help underwrite the cost of the weekend’s activities. Items can be viewed and bid on at www.biddingforgood.com/accoc. The auction closes at midnight on May 15th. There is an official limited edition LCBC Grand Celebration commemorative T-shirt that’s being sold only during the celebration weekend. The shirt was designed and manufactured by East Coast Printers. The all-over design is dyed into the fabric and features renderings and opening dates of both the old and new bridge. Selling price is $20, with all profits helping to fund the celebration. Adult sizes only.